by Jessica Miller (Emery Street) | This column provides tips on reducing waste while saving money. Good news, Eau Claire! All waste management companies (Boxx, Veolia, Waste Management, etc.) now accept plastics #1 through #7 in your recycling bin. Recycling is great, but the real ecological solution is to avoid accumulating unneeded containers. If you are able to, you can try making some food yourself every now and then. Here is an easy way to make perfect peanut butter. This home-made peanut butter will generally be more expensive than your basic supermarket product, but it will cost the same or less than the fancier natural peanut butter, and it’s exactly the same thing. 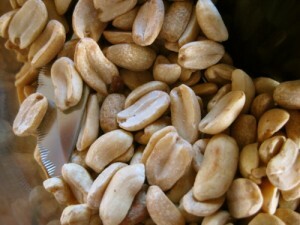 In a food processor, blend 1lb roasted peanuts and 2 Tbs oil (preferably peanut oil). Blend for at least 3 minutes straight until the texture starts changing towards that of peanut butter. For the smoothest peanut butter, blend at least 3 more minutes, but it’s up to you to decide the texture you want, which is a benefit of making the peanut butter yourself.